My cheeky big girlie is a school girl now. 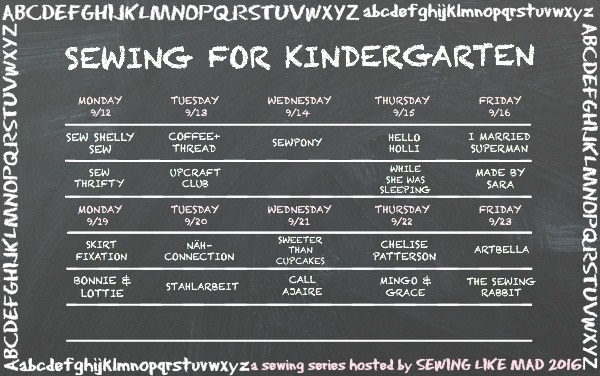 Which means I can finally participate in Mie's annual Sewing for Kindergarten series! The series celebrates children who start the first year of compulsory education. For us in Victoria, Australia, it is Prep. Australian school year starts at the end of January - early February, so Miss R is over half way through her first year of schooling. Miss R is very smart, however large groups of people and noise can be overwhelming for her. To accommodate her personality and learning style we chose a small Catholic school for Miss R. She is doing very well academically while turning into a little social butterfly. Miss R is happy now, however she was not excited about starting school at first, not a tiny little bit. She loved kinder (pre-school) and wanted to go back there. I knew she needed time to adjust and did not push the topic of school onto her. I needed to adjust to the idea that my little companion will not be with me as much anymore. I may or may not have shed a little tear leading up to Miss R's first day of school (totally cried like a baby one night). The first day of school came and Miss R seemed fairly confident. She walked through the school yard towards the classroom in her over-sized school uniform, and I felt proud, happy and a little sad at the same time. My first baby just started school! It felt a little surreal. I asked Miss R what was her favourite part about being at school, and she promptly replied it was Show and Tell and playing with friends during lunch break. The worst part is when it gets noisy, because noise hurts her ears and teachers say, 'One, two, three, eyes on me', and then everyone needs to be quiet which is boring because she cannot talk. Miss R wears school uniform five days a week, however I still want to be able to wrap her in mummy-made goodness, even on school days. What's the solution? Outerwear! 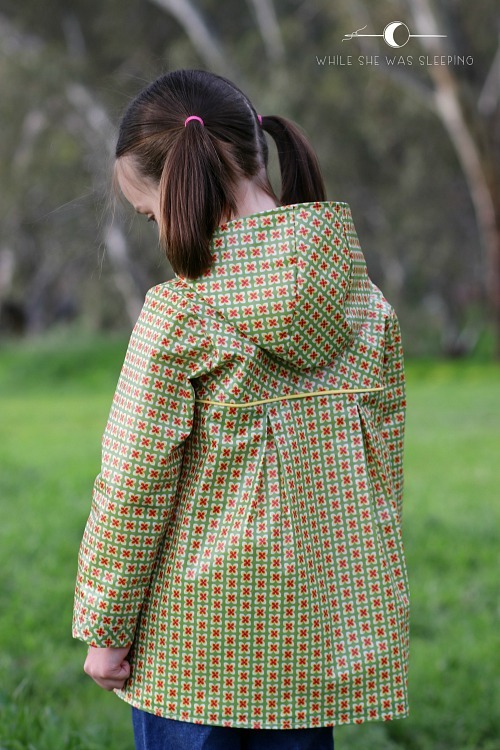 While she was sleeping, I made a raincoat for Miss R. Making a raincoat has been on my sewing bucket list for ages. 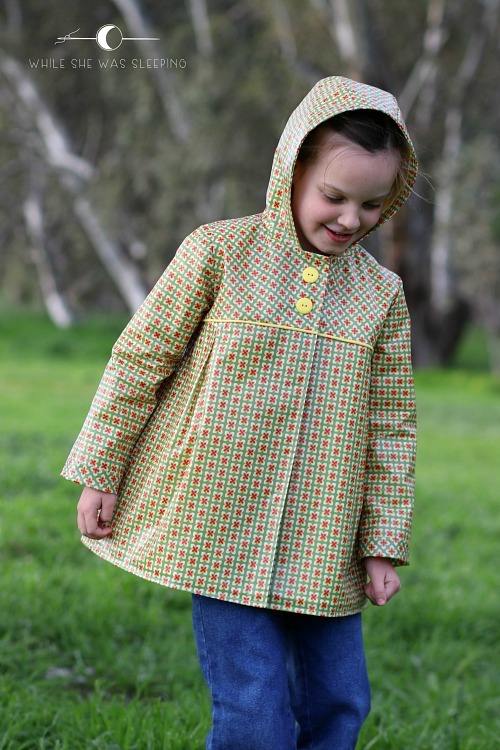 I have a few coat patterns that I think will make great raincoats. 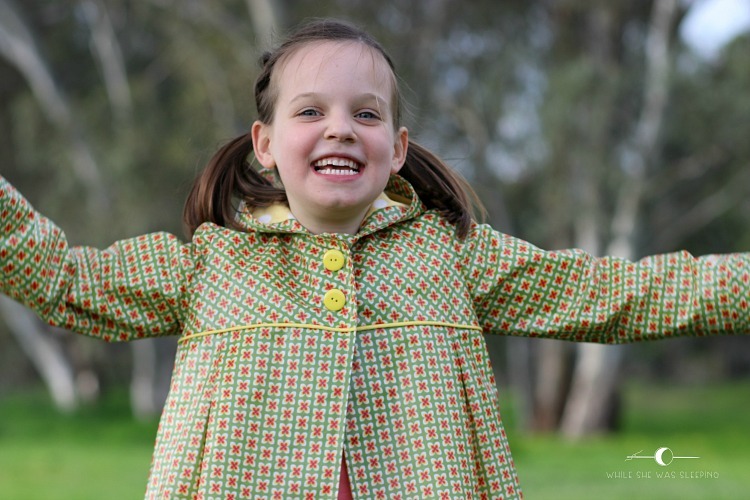 I chose the Moiano coat pattern by StraightGrain patterns, and only replaced the gathered sleeves provided in the original pattern with 'regular' sleeves (a free pattern piece An shared on her blog). 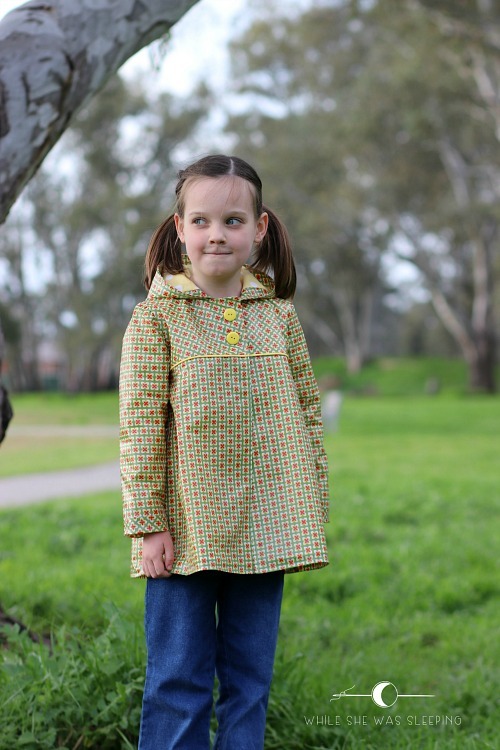 I made a size 5 raincoat which is a little roomy at the moment. I added 5 cm to the length of the coat and 2 cm to the length of the sleeves. Oh, and I skipped the pockets. Pockets full of water is not my thing. 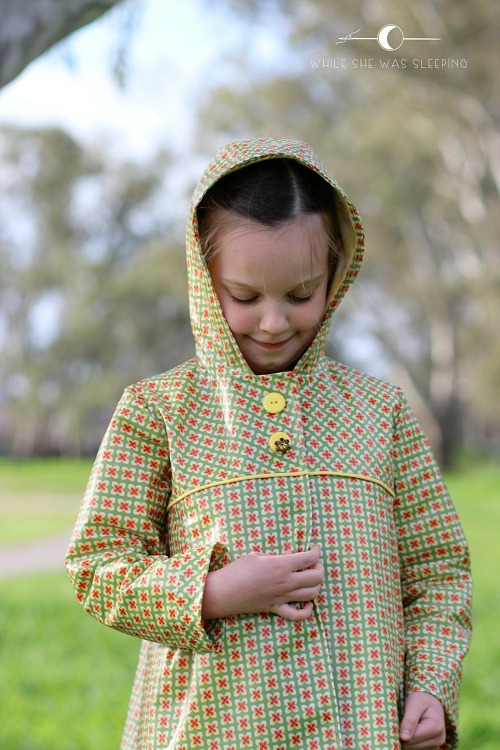 Miss R chose Little Daisy Green laminated cotton from MaaiDesign for her raincoat. I decided to play with the direction of the print. I thought it would add some interest and spare the trouble of having to match the print on gazillion pattern pieces. Yeah, I am a cheater. But I was so busy cheating that I did not realise I cut the sleeves cross grain. I was nearly devastated when I noticed the mistake. Shelley suggested this could be a grain-blocked raincoat (like colour-blocked, yeah?) which I thought was both clever and funny. I was not convinced I would ever be able to see past my mistake, however once the sleeves were in they did not look too bad. It is not a secret that I love piping. I have no idea if it is OK to use piping with laminated cotton. I decided to give it a go and I love the result. I thought about adding piping to the central panel of the hood and the cuffs, but restrained myself. I half-regret not adding it now. The biggest challenges of this project were sewing the curved seams on the hood and setting in the sleeves. The seam along the central panel of the hood is curved. I had no problem sewing the lining of the hood which is made from flannelette. Woven fabric was easy to manipulate, however laminated cotton is stiffer and is not easily shaped by fingers, if this makes sense. Going slow and using a ton of pins helped a lot. I just made sure I pinned fabric within seam allowances. 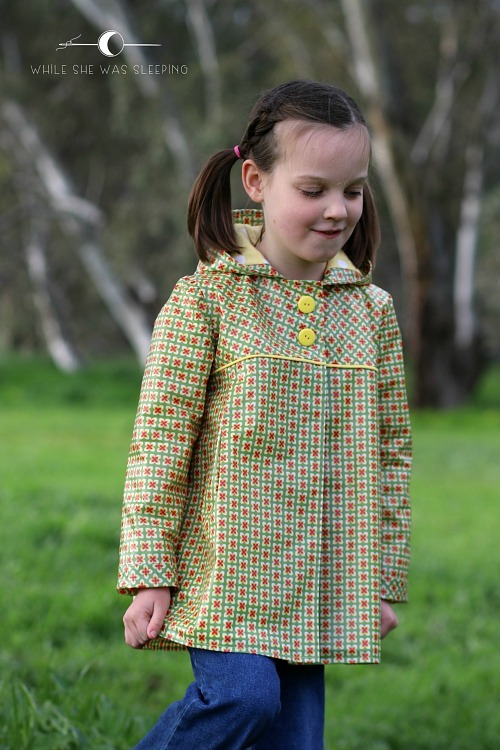 I have not seen a Moiano coat with regular sleeves before I started sewing this raincoat. I was hoping I would be able to manipulate the sleeves in without having to gather them, but my sneaky plan did not work. Friends, I do not like gathering regular fabric. It turns out I enjoy gathering laminated cotton even less. Going very slow and consuming a lot of chocolate in the process was a key to (almost) success. There is some puckering along the shoulder seams and under the hood, but taking into account it was my first go at sewing with laminated cotton, I can live with these minor imperfections. 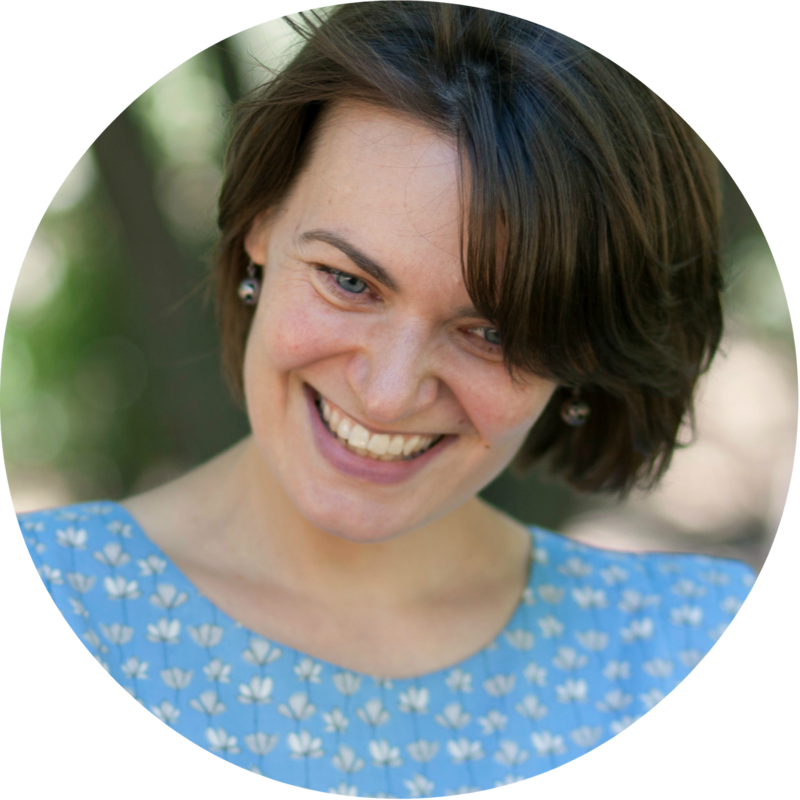 By the way, Maaike offers some tips on sewing with laminated cotton in this post. 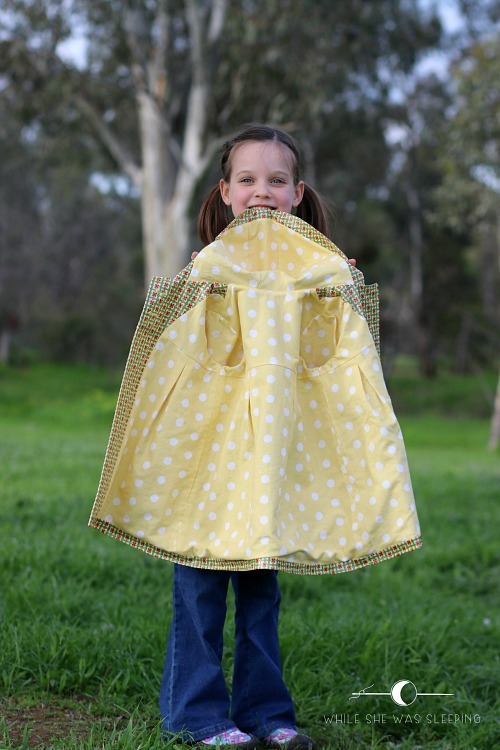 I used yellow flannelette with large white polka dots for lining. An suggests to use lightweight and preferably slippery fabric for the lining, so I did the opposite. 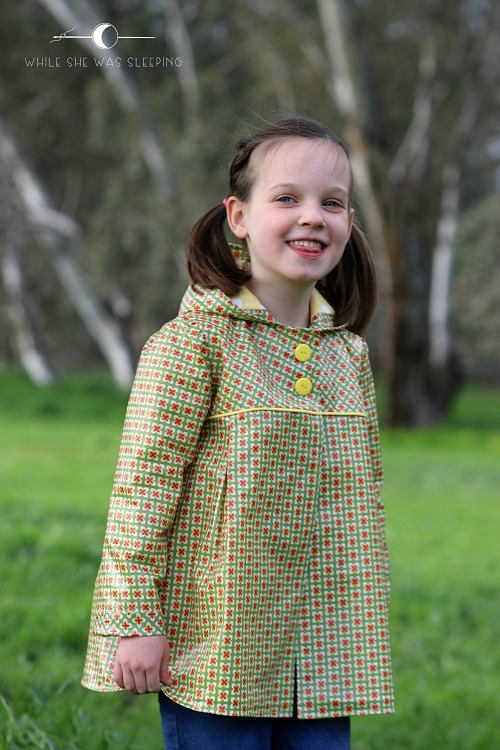 This raincoat was meant to be worm throughout wet winter and spring months, so I wanted to add a little warmth factor. I thought flannelette would cushion any possible stiffness in the seams in laminated cotton also. For the record, the seams are not stiff, even with piping added to them. The verdict? Miss R loves her raincoat. She wore it to school a day after it was finished as it was raining. 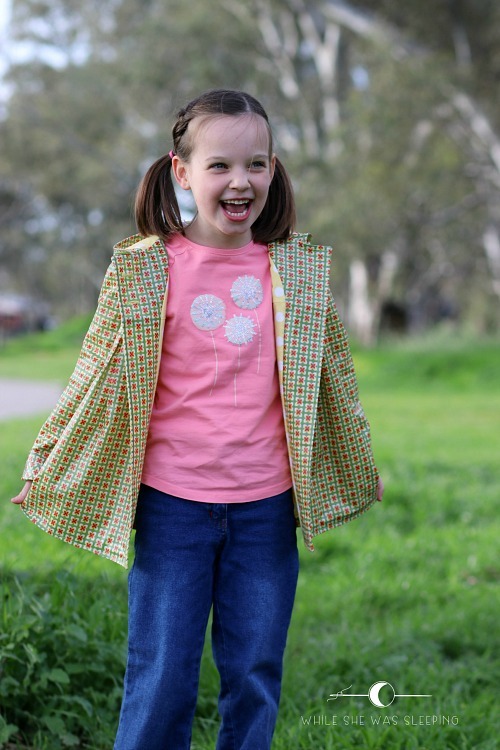 She felt proud that she did not have to carry an umbrella and that her mummy made her a raincoat that helped her stay dry. She noted that only her hands and her shoes were getting wet, but it was OK in her books. As for me, I am chuffed I finally made a raincoat. It is far from perfect, but it is pretty awesome. Please visit other participants to see what they made for their kids. Such a great result!! I love everything about it! I now going to find your raincoat :D There were a few frustrating bits in the process, but all in all it was relatively easy. Wow this is beautiful Jenya! I've meant to see a raincoat too, and now I want to even more!! The coat turned out great! Love the addition of piping! Glad she enjoys her school! Thank you Olga :) Piping is my drug of choice! Its gorgeous Jenya . so glad she can still wear some mummy makes to school! 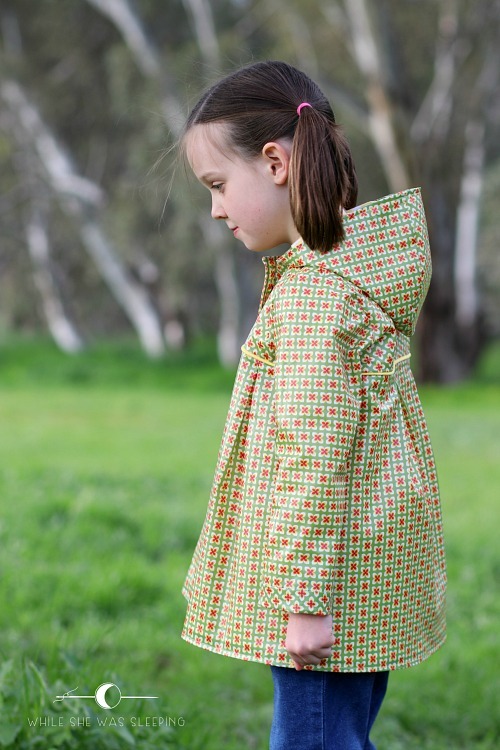 I disagree with you -- this raincoat is PERFECT. I like the idea of grain-blocking, gotta love Shelley. This was such a sweet post to read. 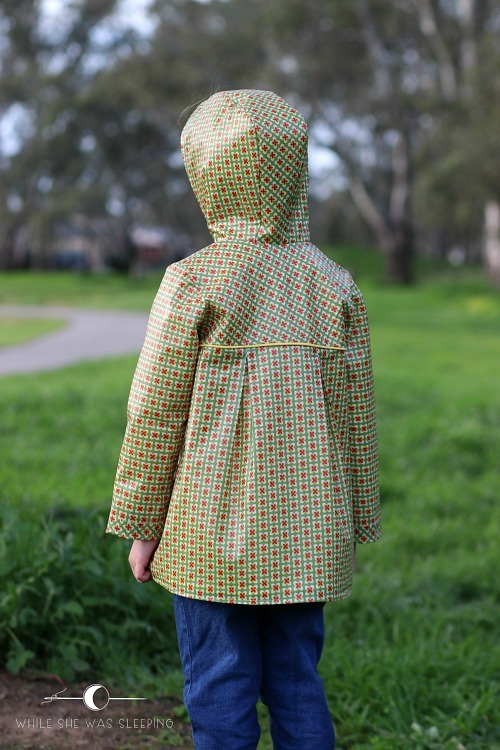 I could feel the love you put into making her raincoat, and I love how you talk about dealing with the emotional aspect of sending your child off to a new school. Beautiful. Her smile is just the best! It IS perfect, really! I totally understand your little miss R was proud to wear this one to school. The uniform makes all kids look the same, but she manages to stand out and be unique like this! Thank you Eva. 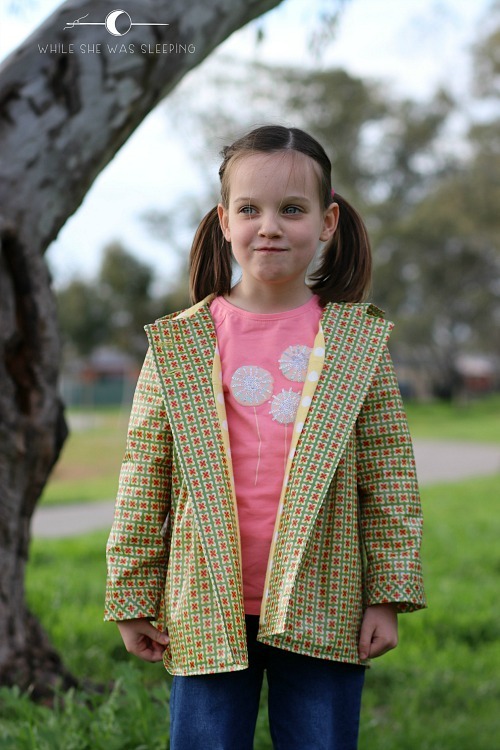 Yes, making a fun rain coat was my way of rebelling again the sameness of the school uniform!